Turbocharging might have spread to the entry-level models in the 911 range, but for many fans there’s only one real 911 Turbo. The new 911 Turbo S is also among a select group of road going 911 models to boast a top speed in excess of 200mph, with official performance claims pointing to a potential maximum of 205mph – the same top speed achieved by the frenzied 611bhp 911 GT2 RS produced in 2010. Hot on the heels of the freshly updated (and now turbocharged) 911 Carrera models, the Porsche 911 Turbo (and faster-still Turbo S) gets its own raft of refreshments for 2016. A 20bhp power boost. The Turbo’s 3.8-litre twin-turbo flat six has been in the engine shop for some detail fettling, with altered inlet ports, newinjection nozzles and higher fuel pressure the primary tweaks. The result is a 533bhp total for the Turbo, and 572bhp for the Turbo S, which also gets new turbochargers with larger compressors. Getting from 0-62mph in the Turbo S now takes a gut-churning 2.9sec and top speed’s risen to 205mph (3.0sec and 198mph in the Turbo). And yet both cars are a touch more fuel-efficient than before thanks to revised engine and gearchange mapping. 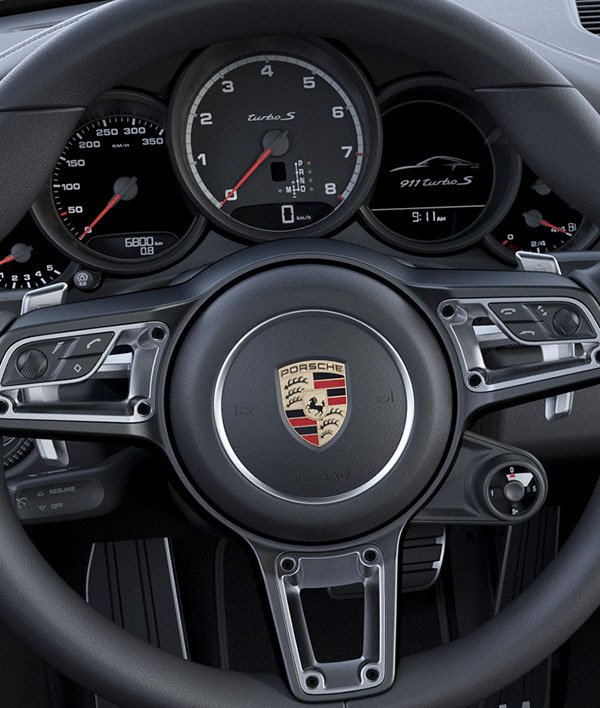 As before, dual-clutch PDK is the only transmission option. Also new is a ‘dynamic boost’ function for faster-than-ever response. When the car’s in Sport or Sport Plus driving modes, the throttle valve stays open if the throttle pedal’s released briefly (but fuel injection doesn’t, so you’ll actually slow down), supposedly virtually eliminating lag when you put your foot down again. Incidentally, the driving modes are now accessed via a manettino-style rotary switch on the steering wheel, rather than groping around near the gearlever. Along with the performance gains, Porsche claims a 2.0mpg improvement in combined cycle fuel economy across the range, with the coupe models returning 31.0mpg and the cabriolets 30.4mpg. Like the rest of the updated 991 range, there are a few detail design tweaks. Very detail; it might take a glance or two to work out what’s different, but new LED light inners at the front, 3D-effect tail-lights, altered air intakes, grilles and wheels are the main spot-the-difference clues. As well as gaining a new-look design, the wheels have also grown wider by half an inch on the Turbo, to the same size as the Turbo S.
Inside, there’s that new steering wheel, with a design borrowed from the 918 Spyder, and a much-improved multimedia system with internet-enabled sat-nav mapping. Both models go on sale today, with deliveries in the UK and Ireland from the end of January 2016. As before, buyers can pick from Coupe or Convertible bodystyles, both available from the start. Stuttgart. At the start of 2016 at the North American International Auto Show in Detroit, Porsche is presenting another highlight of its product range. 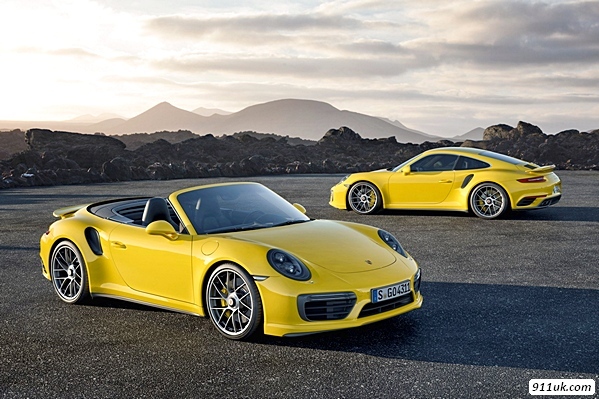 The top models of the 911 model series – the 911 Turbo and 911 Turbo S – now boast 15 kW (20 hp) more power, a sharpened design and improved features. The models will be available in both coupe and convertible versions from the start. The bi-turbo six-cylinder engine in the 911 Turbo with 3.8 litres of displacement now has a power output of 397 kW (540 hp). This power gain was achieved by modified inlet ports in the cylinder head, new injection nozzles and higher fuel pressure. 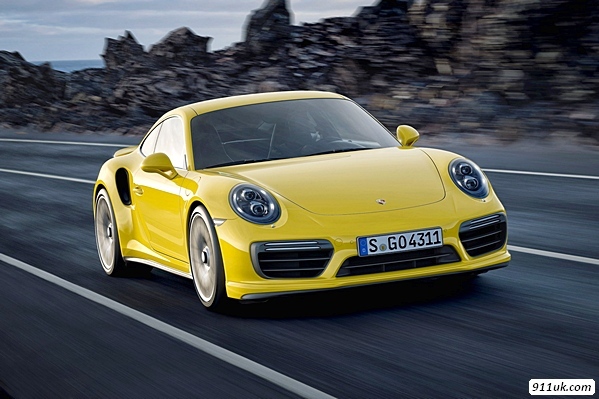 The 911 Turbo S now develops 427 kW (580 hp) thanks to new turbochargers with larger compressors. 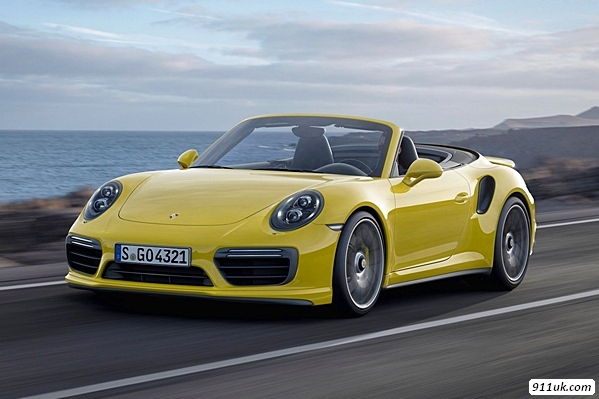 Porsche is still the only manufacturer to utilise turbochargers with variable turbine geometry in petrol engines. The new GT sport steering wheel – 360 mm in diameter and with a design adopted from the 918 Spyder – comes with what is known as a mode switch as standard. It consists of a rotary ring with stepped positions that is used to select one of the four modes Normal, Sport, Sport Plus or Individual. The Individual setting lets the driver configure and store a very individual vehicle setup. Another new feature of the Sport Chrono Package is the Sport Response button at the centre of the mode switch. In-spired by motor racing, it preconditions the engine and gearbox for the best possible responsiveness at the push of a button. In this state, the vehicle can produce optimal acceleration for up to 20 seconds, such as for an overtaking manoeuvre. An indicator in the instrument cluster in the form of a running timer shows the driver the elapsed time. Sport Response functionality can be called up as often as desired and from any of the driving modes. 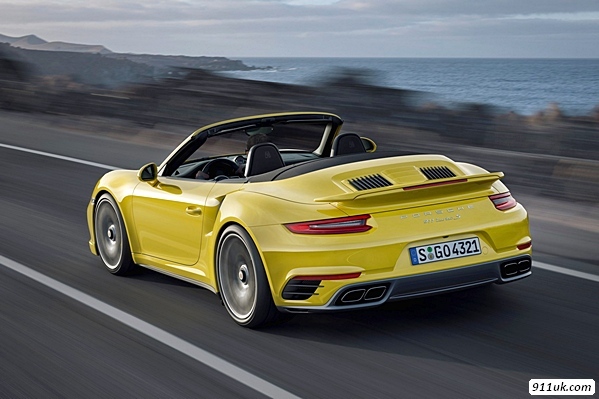 Naturally, the new generation 911 Turbo adopts significant characteristics of the striking design of today’s Carrera models, supplemented by typical 911 Turbo special features. The newly formed front end with side airblades and precisely laid out narrow LED front lights with double fillets give the front end a wider look in combination with the additional fin in the central air intake. In a side view, the high-performance sports car boasts new 20-inch wheels. 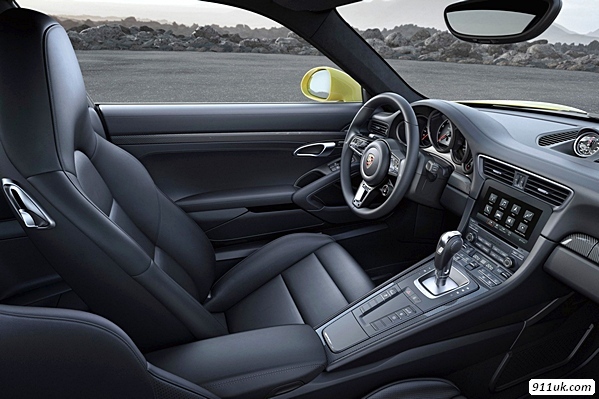 On the 911 Turbo S, for instance, the centre lock wheels now feature seven instead of ten double spokes. Also new are the wheel dimensions for the 911 Turbo: with 9 J x 20 at the front and 11.5 J x 20 at the rear, the new wheels are now each half an inch wider. They are now the same size as the wheels of the 911 Turbo S. The new door handles now come without plastic shell inserts – just like on the Carrera models. The rear body was also thoroughly reworked. Eye-catching at first glance are the three-dimensional rear lights with their four-point brake lights and aura-like illumination, familiar from the 911 Carrera series. The exit openings for the exhaust system at the rear as well as the dual tailpipes were redesigned. The rear lid grille was also redesigned, and it now features three parts: the right and left sections have longitudinal louvres, and in the middle there is a separate cover for optimised air induction for the engine. 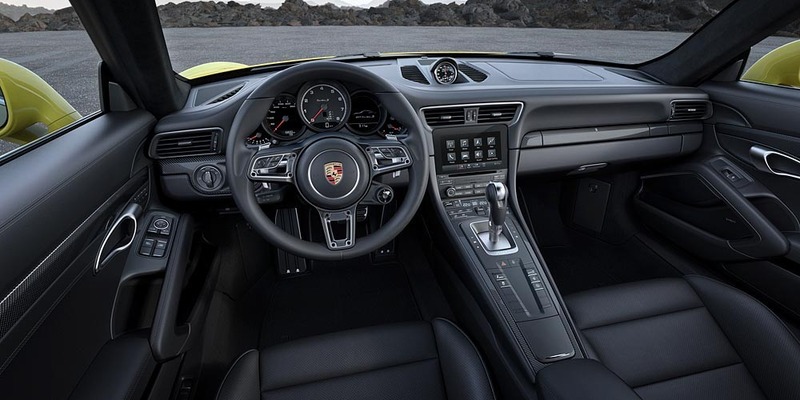 Along with the generation change in models, the newly developed infotainment sys-tem, PCM with online navigation, is making its way into the cockpits of the 911 Turbo models as standard. This system can be made out by a multi-touch monitor with high-quality glass surface, which is perfectly integrated into the centre console, and it offers numerous new and extended connectivity functions thanks to the standard Connect Plus module. Navigation can also access the latest traffic information in real time. Routes and places can be visualised with 360-degree images and satellite images. In addition, the system can now process handwritten inputs. Moreover, mobile phones and smartphones can now be integrated more quickly, easily and comprehensively than before via Wi-Fi, Bluetooth or cable. Select vehicle functions can now be controlled remotely as well. As in the previous models, the Bose sound system is offered as standard; a Burmester system can be delivered as an option. EPIC! Just can't find a better word right now. Love the steering wheel, the front seats look really thick and comfortable. 0-60 in 2.9 seconds, my bet is it will be quicker than that. Chris Harris via Twitter - "Glad the 991 Turbo S just became faster. 'This just isn't fast enough' I thought, as the last one dragged the cheek flesh from my skull." They still look bloody huge imo. Posted: Tue Dec 01, 2015 2:50 pm Post subject: 4 wheel steer? Is it just me or did they really not put 4 wheel steer system on this facelifted Turbo?? Steering wheel looks a little busy for me. Other than that, wow. I'm interested in how the anti lag tricks play out. But where can you lay all that power down? One for the continent that's for sure. Epic performance...but...it doesn't feel the same anymore. Seems like another genuine step improvement for the 3.8 litre turbo range. Not so sure about the fussy rear end bumper arrangement on the S.
What a tool that will be. Launch colour doesn't suit the turbo for me, but i think they may need to include jet lag reducing instructions with this one.